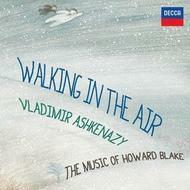 Vladimir Ashkenazy returns with an unexpected album of compositions by his long-standing friend Howard Blake, best known for the Christmas favourite Walking In The Air. Walking in the Air, which Ashkenazy has chosen as the title track of the disc, is arranged here for solo piano (and available as an e-single). The song was composed by Blake as the centrepiece of his score for the children�s classic animated film 'The Snowman', and exemplifies the composer�s warmly accessible style. Howard Blake�s illustrious career has spanned over 50 years in which he has composed more than 650 works, both classical and popular. He has written scores for numerous films, beginning in the 1970s, but it was in 1982, with his orchestral score for 'The Snowman' that Blake achieved widespread acclaim. While he is best known for the Christmas classic, he has written a wide range of music, including a piano concerto for the 30th birthday of Princess Diana.